I didn’t ask permission from my editor to depart from my normal question and answer format, but I’m sure he’ll agree this is a long overdue column. I’ve been writing this column now for over twenty-three years. Ask the Builder was first published October 2, 1993. It was my original goal to help you get the most for your money when you hire a remodeling contractor or a builder to make your building dreams come true. Over the years, this goal has been reduced to a simple sentence that’s at the bottom of each issue of my free newsletter: Do It Right, Not Over! Sadly as each week passes, I feel like I’m pushing a large boulder up a mountain. I say this based on what I see with my own eyes and the vast amount of email and comments I receive each day at my AsktheBuilder.com website and on my hundreds of YouTube videos. It’s painfully obvious that you and millions of other homeowners need a quality control checklist before you start a project. This checklist would allow you to understand what needs to be done so you don’t have to do things over wasting your valuable money and time. Here in New Hampshire, a new house is being constructed in my town. I pass it all the time going to and from town. I decided to stop by as often as possible to get photos for you and to monitor the progress. What I see each time I stop shocks me. The day the subcontractor poured the footing I was there. The footing of a home is perhaps the most critical aspect of the construction of a new home. The foundation of a home rests on the footing. The footing is in direct contact with the soil under your home and it must be strong. It needs to have reinforcing steel in it. Period. As the weeks have progressed, more and more mistakes and poor quality issues have blossomed at the house. 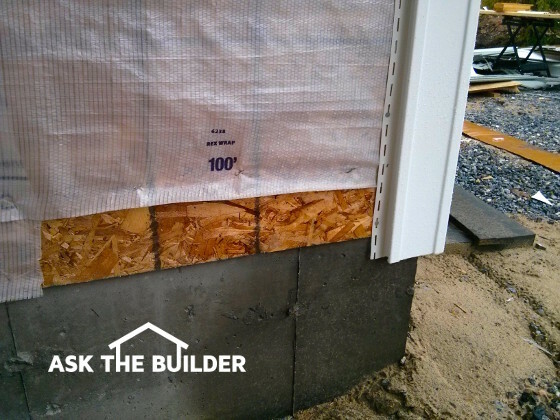 One of the biggest poor quality issues was allowing the insulation and drywall contractors to proceed with their work while the outside of the house was not weatherproof. Here in the Northeast we can get howling Nor’easters in the winter. Most are usually blowing snow, but it’s possible to have a violent wind-driven rain in the late winter. It happened here just weeks ago. All winter long the house sat with no siding on it. The house had a patchwork of air and water infiltration barrier fabric on it. The rough carpenter put a piece of it on each wall as he built them on the floor and tilted them up. He never took the time to apply the special tape to seal the seams. There were some places where bare oriented strand board sheathing (OSB) was exposed with no waterproof covering. His actual method of installing it was wrong as the air and water-barrier product is meant to be applied as one full piece as you’d wrap a birthday present. You end up with just one seam on the underside of a gift box so you should just end up with one seam on the wall on the side least exposed to the prevailing wind. I have no idea how much wind-driven rain penetrated into the walls soaking the insulation, but I’m sure some did. It’s unacceptable to allow this to happen. I’d debate that to my dying breath with any other builder. Last week, the siding contractor finally started to work on this house. It was my hope he’d fix the rough carpenter’s mistakes. Alas, he didn’t. He started to put up his vinyl siding right over the bare OSB and untaped air and water barrier. Here’s my rhetorical question of the day: Did the siding contractor even know he was covering up bad workmanship, or did he know and not care? Both answers are egregious and are representative of an epidemic of poor quality that appears to be the new normal. Oh, I hear you, you’re saying to me, “But Tim, what about the building inspectors and the building code? Won’t those two things protect me and my investment?” No. In many locations, including many towns in New Hampshire, there are NO building inspections. It gets worse. The building code is a set of minimum standards. If you build a house to code, it’s like getting seventy percent on a test. It means you pass by the skin of your teeth. You can build many things with little additional cost and greatly exceed the standards in the building code. I’ve put together a basic new home quality control checklist you can get at my website for free. It can be used on room addition projects and many other projects around your home. I hope it helps you. CLICK HERE to access the FREE new home quality-control checklist.